Angela Pittenger speaks during the inaugural Tucson Storytellers Project where tellers shared stories about Love & Heartbreak at La Cocina on March 12, 2018, in Tucson, AZ. The project was produced by The Arizona Daily Star and #ThisisTucson. Mark Muscoreil has a golden view from a third-level tee box at Top Golf. The main space for workshops in Creative Tribe's new home downtown. Formations dubbed the “Kingdom of the Elves” at Colossal Cave Mountain Park, 16721 E. Old Spanish Trail, on Oct. 18, 2017, in Vail, Ariz. Ortega National Parks has managed the park for about a year now, taking over for Escabrosa Inc. which had managed the grounds for 50 years prior. 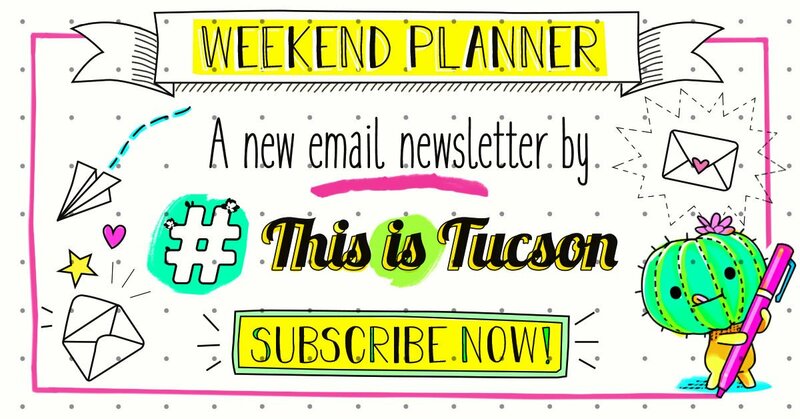 Join us (Arizona Daily Star and #ThisIsTucson) as we celebrate the vibrant and diverse food culture in Tucson. From our love of tamales and tacos to family restaurateurs and growers, we’ll be sharing stories about the tastes that help bring us together. When: Tuesday, June 12, 6:30-8:30 p.m.
Take a cool evening run downtown with your pals and end up at a block party featuring, food, entertainment and a beer garden. You also have a chance to win cash prizes for your running skills. Where: Armory Park, 220 S. Fifth Ave. When: Saturday, June 2, 5-10 p.m. Cost: $10-99 depending on what you decide to run/walk. Register here. The Tucson Pops Orchestra is filling the night air with music during the first two Sundays of June at Reid Park. Be sure to get there early to snag a spot. When: Sundays, June 3 and June 10, 7-9 p.m. If you're an artist who wants their work to be seen, now's your chance! Solar Culture is accepting submissions for its June 9, art show. Just stop by the gallery between Tuesday, June 5, to Thursday, June 7, with your masterpiece and make sure your art is ready to be hung. The art show is free to attend and there's also a potluck. Don't miss this "Best 23 Miles of Mexican Food in America" festival. Admission gets you menu samplings from over 25 wineries, breweries and local Mexican restaurants. Where: JW Marriott Tucson Starr Pass Resort & Spa, 3800 W. Starr Pass Blvd. When: Saturday, June 16, 6-8:30 p.m. Cost: $60 general admission online tickets, $75 at the door if not sold out. How good are you at chess? Test your skills with other players at the Eckstrom-Columbus Library. All players will receive a slice of pizza and water for lunch. Where: Eckstrom-Columbus Library, 4350 E. 22nd St. When: Saturday, June 16, 9 a.m. to 3 p.m. Cost: Event is free to attend. Registration is onsite only and begins at 9:15 a.m.
Have a clucking good time at the Joel D. Valdez Main Library where you'll learn how to select the right type of chicken for your family and how to best care for them. This event is hosted by Southwest Victory Gardens and the Pima County Public Library. When: Saturday, June 16 at 11 a.m. to 12 p.m.
Fore for Father's Day! Have a fun morning of golfing and eating a breakfast buffet with the family. Remember to let the ol' man win on his special day! Where: Top Golf, 4050 W. Costco Dr. When: Sunday, June 17, 9 a.m. to 12 p.m. Cost: $50.00 per person which includes 3 hours golf and buffet breakfast. Father's Day Domino Tournament at 1912 Brewing Co.
Take dad to a fun tourney at the brewery. Dads get to play dominoes and drink a few beers to celebrate his special day. Dinner options will be available and specials on select drinks. When: Sunday, June 17, 11 a.m. to 7 p.m. Kids and adults will love this workshop. Paint a pot to match your garden or to give as a gift. When: Saturday, June 30, 10 a.m. to 12 p.m. Cost: Event is free to attend, $5 and up for supplies. Enjoy a "Beauty and the Beast" themed breakfast with your little one. This event includes playtime and one hour with Belle. Parents will have the option to make the day even more special by adding a beautiful yellow beauty dress from Little Adventures for $29.99. When: Saturday, June 2, 9-10:30 am. Your kids will be able to build their own mini car with wood, paint, stickers, hammer and nails. Event will be located inside your local Home Depot. It's a first come first serve basis, so get your little builder there early to get a kit. Let your kids work on their ninja skills for free at this workshop presented by A-Long's Kung Fu Academy. Here they will learn basic nunchaku techniques, spins and rotations. No need to bring anything either, a foam nunchaku is provided. When: Thursday, June 7, 3-4 p.m. The Pima County Library continues its summer programming with a free magic show for all ages. Don't miss the juggling, magic tricks and vaudeville performances. Children of all ages are welcome. Due to limited space call 594-5365 to register. When: Monday, June 11, 2-3 p.m. Cost: Free, but remember to call and register. This event includes a wood project the whole family can help build together, a visit from superheroes, water play, and super snacks. When: Saturday, June 16, 9-10:30 a.m. and 2:30-4 p.m. Cost: $15 for the first child, $10 for siblings. Parents and caregivers are always free. Here your kids will talk about influential artists — including Piet Mondrian, Andy Warhol, Keith Haring and Jackson Pollock — and create masterpieces inspired by the greats. Event will be focused around ages 6-12. Registration is required and starts June 15. Call 594-5365 to sign up. When: Friday, June 22, 3-4 p.m. When: Saturday, June 23 and Sunday June, 23, 11 a.m. to 4 p.m.
Add some pixie dust to your day. Make a fairy house or garden using broken pots and found objects! Supplies are provided, but you're welcome to bring your own. Where: Mission Library, 3770 S. Mission Rd. When: Monday, June 25, 3-4 p.m.
Shuffle up and deal! Learn how to play card games, like Slamwich, Trash, Set and more. Join the fun and camp indoors. The library will have a special summer camp-themed storytime, songs and s'mores. The events is structured for preschoolers and up. When: Wednesday, June 27, 3-4 p.m.
Have your kiddos been curious about how their body operates? Learn about the digestive system, blood vessels, and lungs at this workshop. When: Friday, June 29, 3-4 p.m.
Feel like a badass and take a free self defense class to improve your mind and self-esteem. This workshop is for mature teens and older. Where: Oro Valley ATA Martial Arts, 11133 N. La Cañada Dr. When: Every Friday for the month of June and July, 6:10-7:10 p.m.
You can either bring a container from home or buy one. Soil, succulents and other plants will be available for purchase. When: Sunday, June 3, 10 a.m. to 12 p.m. Cost: Event is free to attend, pay for what you use. Paint water with water! Mix watercolors and watch your sea turtle glide onto your canvas. This event is hosted by Tipsy Picassos. Where: Frog and Firkin, 874 E. University Blvd. When: Sunday, June 3, 12 p.m. Experiment with a different type of art and make a tile masterpiece. All materials are included with admission fee. Open to ages 16 and up. Where: Magic Garden Nursery and Landscape, 7909 E. 22nd St. When: Saturday, June 9, 1-4 p.m. Cost: $20, please bring cash. Get out you red, white and blue and paint a super hero. When: Sunday, June 3, 7 p.m. Cool off in the studio and learn the basics of using watercolor. You will have the opportunity to mingle with other painters at your skill level and work on you own desert themed masterpiece. Where: Creative Tribe, 236 S. Scott Ave. When: Sunday, June 10, 1-3 p.m.
Summer is here! Paint a colorful beach view and have some wine and beer. When: Saturday, June 9, 6 p.m. Relax and let your worries and your paint run across your canvas. In this workshop you will have the opportunity to create two 12 x 12 canvas paintings. When: Saturday, June 16, 5-6:30 p.m.
Have a marvel of a time painting your own superhero character. Find more Tipsy Picasso painting events here. Where: Gentle Ben's, 865 E. University Blvd. When: Saturday, June 16, 7 p.m. Paint something fun and contribute to the fundraiser. Help out PACC and bring in some yoga mats for the pups that don't have a bed. When: Saturday, June 16, 4 p.m.
Who doesn't like beer and yoga? Participate in a mixed level slow-flow yoga and hang out afterwards and enjoy a pint. Yoga mats are available to rent for $2. When: Sunday, June 17, 10-11 a.m. Pig out at the brewery with some beer and painting. Where: Corbett Brewery, 309 E. 7th St. When: Friday, June 15, 6:15 p.m.
Breathe and flow through the cave and end with a meditation. Wear comfortable shoes and bring your yoga mat. When: Thursday, June 21, 6-7 p.m. Drink some wine and paint your own road trip experience. Find more Creative Juice painting events here. When: Saturday, June 30, 6:30-8:30 p.m. Pull out the hairspray and tease those bangs sky high. In this cult classic Romy and Michele are heading back to Tucson for a high school reunion. When: June 1 and 2, 10-11:35 p.m.
Have a frightfully good time with friends at The Loft. Watch seven horror movies in 12 hours. "Scream" and "The Descent" are some of the movies playing during The All-Nite Scream-O-Rama. When: Saturday, June 2, 7 p.m. to 7 a.m.
Watch Charlie and Snoopy overcome fears and get into trouble. Pre-show activities hosted by Mildred and Dildred Toy Store starting at 9:15 a.m. When: Saturday, June 9, 10 a.m. to 11:30 p.m.
Watch a movie in the theater with the lights turned on and the sound turned low and enjoy a movie in a comfortable environment. When: Saturday, June 9, 10 a.m. to 12 p.m. Cost: First 50 tickets are offered for free from the Autism Society. Have a fun family movie night and go swimming with a minion. "Despicable Me 3" will start at 7:45 p.m. or when the sun goes down. Be sure to bring towels and snacks. When: Saturday, June 16, 7:45-9:45 p.m.
Take dad to go see one of the Oscar-winning father, Don Vito on the big screen. Don't forget to enter in the free raffle for movie-themed prizes. When: Sunday, June 17, 2-5 p.m.
Sensory friendly screening of "Incredibles 2"
The theater is turning the lights up and turning the sound down. Enjoy a new movie release in a comfortable environment. When: Saturday, June 23, 10 a.m. to 12 p.m.